We have been organising made-to-measure educational visits for children from 3 to 15 years old for more than ten years. Ranging from a simple visit of the castle to a selection of workshops on medieval themes, we prepare visits and activities with teachers in order to meet your exact requirements. 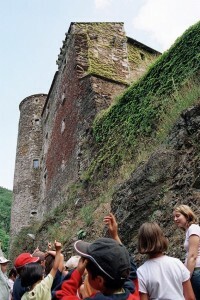 Ces visites peuvent prendre différentes formes : une visite guidée du château accompagnée ou non d’ateliers sur le Moyen Âge. “Initiation to medieval and Renaissance dances”: learn two or three ancient dances. Worksheets will be supplied for the children on the day of your visit. Download our 2015/2016 brochure here. Please telephone us on +33 (0)5 65 99 79 45 for a programme adapted to your class and a quote.